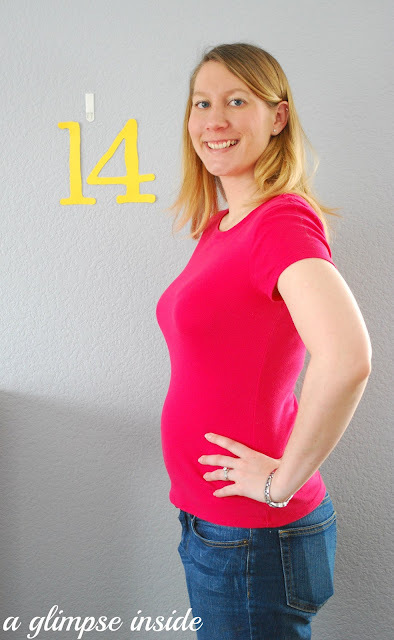 Hello Week 14 and HELLO second Trimester! Sleep: Sleeping great so far! Best moment this week: Celebrating my first Mother's Day and watching Miss P trying to walk more and more. Movement: Nope, not yet. But there have been a few times that I feel a sharp something or other depending on how my belly is positioned and think... baby?! Food cravings: Not really craving anything yet. If I can eat any food, and a complete meal- that's a success! Anything making you queasy or sick: I have been feeling sick after most of my dinners lately no matter what I eat. When I get congestion, I want to be sick. And still the occasional feeling of just my hair on my neck makes me feel sick. Symptoms: Morning sickness and Congestion! BLAH! And a day ago, my sciatic nerve bugged me for a little bit but luckily that went away. Looking forward to: I have a doctor's appt. on Friday so looking forward to hearing that little heartbeat again! Love this update format! You are looking so cute! I hope your nausea goes away soon! BLECH!